shines down upon us to let us know they are happy."" 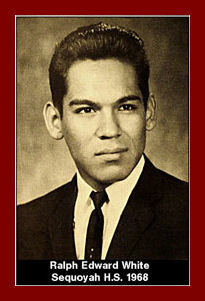 Ralph “Bull” Edward White, age 60, died at the OSU Medical Center in Tulsa, Oklahoma on November 25, 2010. Ralph was born on June 28, 1950 in Miami, Oklahoma to Robert B. Sr. and Ada Georgia (Bent) White. Bull worked for the Seneca-Cayuga Nation as a Manager before retiring. He was the Faith-keeper for the Seneca-Cayuga Tribe. He enjoyed playing horseshoes and going to the casino. His children survive Bull, Robin Bennett (John) of Sand Springs, Ross Steven White of Okmulgee, Oklahoma, Raelynn Seaton of Afton, Oklahoma, stepdaughter Kellie Patapony of Glenpool, Oklahoma, twelve grandchildren and two great-grandchildren. He is also survived by his brother’s and sisters, Cheyenne White of Seneca, Cayuga, Reuben White, Sr., of Joplin, Missouri, Raymond “Louie” White of Catoosa, Oklahoma, Roger “Horse” White of El Reno, Oklahoma, Randall “UR” White of Grove, Oklahoma, Ruby “Stick Sequichie of Miami, Oklahoma and Roberta White Smith of North Miami, Oklahoma. Bulls was preceded in death by his parents Robert B and Ada G. White, and four siblings Robert White, Jr., Richard N. White, Ronald J. White and Rosemary White Chase Fox. Graveside services will be held at 10:00 a.m., on Saturday, November 27, 2010 at Bassett Grove Cemetery north of Grove, Oklahoma with Paul Barton and Derek Sandy will be speaking. Serving as casket bearers will be Thomas “Razor” Chase, Caden Chase, Eric “Log” Logan, Ryan “Buck” White, Robert “Gomp” Smith and Curtis “McGee” Logan. Honorary casket bearers will be Paula Greenback, Bob Tressler, Mary Jumper, Ruben Freeman Tommy R. Stand and Jimmy Horse.